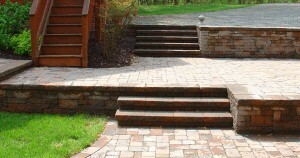 Our custom patios and walkways convey your unique, distinctive and personal style. We help you define your ideal outdoor gathering area and design a custom space that creates the perfect atmosphere for entertainment, leisure and pleasure. Integrating exquisite walkways into your patio design guides your guests through your landscape, unifying your landscape elements. We consider scale, color, texture and grades, as well as characteristics of the existing home architecture, to harmonize all components of the landscape. Patios and walkways are constructed with high quality products such brick, pavers and stone which are available in a variety of different colors, textures and sizes. We design to your unique style and how you want to use and enjoy your space – whether it’s a stunning outdoor room, an inviting entryway, or a year-round display of nature’s most beautiful colors. Just like a painting, gardens should have a balance of elements that complement and enhance each other. Accent plants, color groupings, and repeated patterns are pleasing to the eye and create visual interest. Plants are chosen for a variety of different purposes – shade, height, color, texture, fragrance, privacy and enjoyment. Sun and shade exposure, dry and moist areas, plant shape and growth, and growing zone are also considered when making plant selections. We use only high quality plants from reputable growers to ensure that every plant thrives in its most suitable environment. 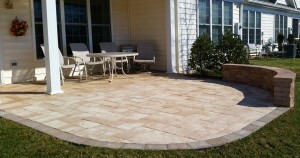 Retaining and seat walls can turn your outdoor living area into a great place to entertain and relax. They are focal points that bring multiple dimensions and texture to your landscape by dividing and defining your outdoor space. Walls are designed for a many different purposes and are constructed in a variety of styles, shapes, heights and lengths. Retaining walls expand and make the best use of your outdoor space in areas that were previously hindered by grades, drainage and other factors. Seat walls create comfortable backyard seating within a gathering area. 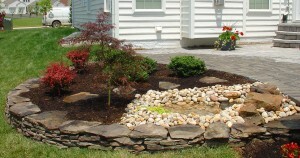 They can create a border around patios and flower beds and double as a place to sit down and enjoy your landscape. We construct our walls using a variety of high quality products such as natural stone, which can be dry-stacked or mortared, masonry block with veneer or stucco, and precast modular block, which is a high quality manufactured wall system available in a variety of colors, textures, shapes and patterns.